New Amazon Fire TV Stick 4K supports Dolby Vision, Atmos and HDR10+ | What Hi-Fi? Just as the dust is settling on Amazon’s bold move into the hi-fi multi-room market, the shopping goliath has announced a new video streamer. 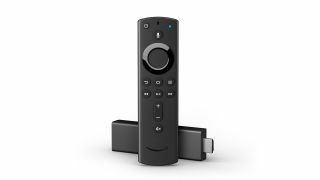 The Fire TV Stick 4K is the next-gen streaming stick to accompany the 1080p Fire TV Stick with Alexa that was introduced early last year. You can wave goodbye to the Fire TV 4K box, then. Amazon's streaming hardware is now stick-only. Amazon claims the new version is the most powerful streaming stick around (it’s supposedly 80 per cent more powerful than its predecessor), featuring a new quad-core 1.7GHz processor, as well as a more powerful 802.11ac wi-fi chip and new antenna technology for 'seamless' 4K streaming and quicker load times. And the Fire TV Stick 4K needs that boost in power, too - what with it supporting 4K, Dolby Vision, Dolby Atmos and HDR10+. That's one up on the rival £70 Google Chromecast Ultra dongle (which only has 4K and HDR), although next week's Google event could bring the Chromecast line up to speed. Amazon claims such premium content on its Prime Video platform should be easier to find using the all-new Alexa Voice Remote (which comes with the new stick, although can be purchased separately for £30 too). Saying ‘find 4K movies’ into the Alexa-powered remote should bring up ‘thousands’ of Ultra HD titles. The TV Alexa voice control experience can also be accessed via an Echo device. If you have only one Fire TV, your Echo device will pair as soon as you ask Alexa a question that includes Fire TV. In addition to facilitating voice commands, the Alexa Voice Remote also features features dedicated power, volume and mute buttons for controlling compatible TVs, soundbars and receivers. The Fire TV Stick 4K is available for pre-order on Amazon for £49.99 and will start shipping on 14 November.